The Mazda MX-5 has been named World Car of the Year at the 2016 World Car Awards, ahead of the Audi A4 and Mercedes-Benz GLC. Mazda’s iconic roadster – which won UK Car of the Year earlier this month - also bagged the World Car Design award at the World Car Awards which were staged during the second day of the New York Auto Show. In other categories, the title of World Luxury Car went to BMW 7 Series, ahead of the Audi Q7 and Volvo XC90 while the Audi R8 Coupe beat the Honda Civic Type R and Mercedes-AMG C 63 Coupe to World Performance Car. Meanwhile, Toyota’s hydrogen-fuelled Mirai won World Green Car of the Year, beating its own Prius hybrid and the Chevrolet Volt. The winners are decided by a jury of 73 international motoring journalists – five from England – via a secret voting ballot. 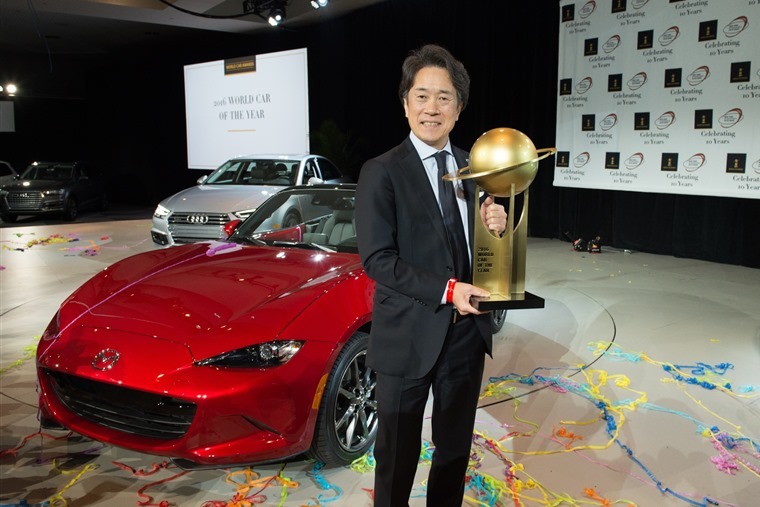 Masahiro Moro, President and CEO of Mazda’s North American Operations, said the MX-5’s double award was “a wonderful honour”. He reacted: “This award is proof that it is as young, vibrant, fun and relevant as ever, and proof that every Mazda looks as incredible as it drives, and drives as incredibly as it looks. Ikuo Maeda, General Manager of Mazda’s Design Division, added that the award was “proof that our designs can connect with people all around the world”.